London, November 2011  Doing-it-yourself is a great way to save money on home improvements, especially when finances are tight. But getting the materials needed for DIY jobs can prove a challenge, especially for those who only have small cars or no car at all. Doing home removals yourself rather than calling in a removals company is also good for making savings. But the risk could be that hiring a van to move materials and furniture around could eliminate all the savings of doing it yourself. Europcar, the leader in car hire services in Europe, is aiming to make DIY and home moves easier and more cost-effective this Autumn by offering van hire from only £19 per day, available from over 130 locations across the UK. Europcar can also deliver vans through weDeliver, its chargeable delivery and collection service . But many drivers will be unfamiliar with what sort of van is best for the job and what they should expect to pay for van hire. Plus they may even be nervous about driving a vehicle much bigger than their car. Thats why Europcar is offering a wide range of vans to help DIY-ers get the materials and furniture they need, safely and cost-effectively, with great rates and no extra charge to add another driver. Plus its offering advice and tips on its website to help select the right van for the job. 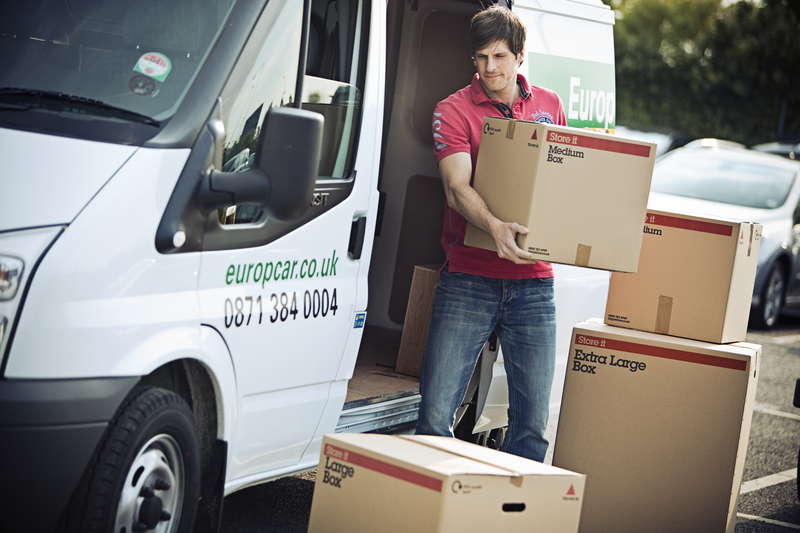 Europcar also offers a convenient overnight van hire service from 5pm until 9am the following morning for people who are busy during the day and want to pick-up or move furniture in the evening. From the small Vauxhall Combo to the Ford Luton box van, Europcar has a van to suit a wide range of needs. Tail lifts come equipped as standard with box vans from Europcar, making it even easier to pick-up essential tools or equipment. And all Europcar vans are fully maintained to manufacturer specifications and covered by 24 hour breakdown, for added peace of mind. Driving your van  be safe! Driving a van is not so very different from driving a car. The controls, the driving position, even the feel of the vehicle on the road – none of these is radically different from what you’ll be used to when you’re driving a car. But there are some important differences to remember, to look out for and to be aware of. Are all the doors securely closed? Vans have rear or side cargo doors. Make sure they’re closed securely and can’t come open when the van is moving – even more important if you’re carrying something. It’s surprising how little movement of the van it takes for an unsecured load to slide around uncontrollably – and dangerously. Be aware of the width, length and height of the van, especially if you’re not used to driving one. It’s rare for a van to be so tall that it’s a problem, but the height will be clearly displayed just above the driver’s side of the windscreen and particularly low bridges or other road hazards (like low petrol station canopies) will usually be clearly marked with a height restriction. When you’re driving under a bridge, look out for road markings that tell you clearly how close you can drive to the edge without causing a problem. Watch out for trees with low-hanging branches. Take corners slowly – it is possible for a heavily loaded van to tip over sideways if you take the corner too fast – and do remember that vans need more room to turn. Pay very close attention to public warnings if you’re driving on an exposed road in windy weather. Remember that the larger or heavier the vehicle, the longer it takes to stop, especially in icy or wet conditions. Watch out very carefully for cyclists and bikers – they’re often tempted to overtake on the blind side. Europe, providing car mobility to 6 million customers. Through its franchisees and partners in over 150 countries, Europcar gives access to the #1 network in car hire. Europcar brand portfolio generated revenue of c.3.1 billion including c.2.0 billion Europcar group revenue. Supported by 6,600 dedicated staff and with long-standing local presence, Europcar facilitates the mobile lives of its customers around the world, offering them customised and innovative car mobility solutions. Winner of the first World Travel Award recognising the World’s Leading Green Transport Solutions Company, Europcar also was honoured with the Award in 2010, the second time it was presented. Europcar is a subsidiary of Eurazeo.